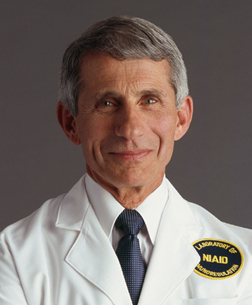 Dr. Anthony Fauci has made influential contributions to the understanding of how HIV destroys the bodys defenses, leading to the progression to AIDS. His discovery demonstrating that HIV replicates extensively in lymph nodes during the early asymptomatic phase and continuously destroys CD4+ T lymphocytes, which leads to the deterioration of the immune system. Dr. Fauci shows that early treatment by using highly active anti-retroviral therapy (HAART) will effectively control HIV replication, demonstrated by the reduction of the HIV viral load and number of CD4+ T lymphocytes. The approach taken by Professor David D. Ho and Dr. Anthony Fauci has been widely embraced and set a new standard for HIV/AIDS patient treatment  changing AIDS from a lethal, untreatable disease to a chronic one, and saving millions of lives throughout the world.